Postmortem shows Nkaissery died of a rare heart attack, medics rule out foul play – Kenyatta University TV (KUTV). All Rights Reserved. The late Interior CS Joseph Ole Nkaisserry suffered a heart attack, preliminary investigations have revealed. A postmortem conducted on Monday to determine the cause of Nkaisserry’s death indicated that he suffered a condition known as myocardial infarction. In medical terms, this kind of heart attack is the irreversible death of heart muscle secondary to prolonged lack of oxygen supply. This is also known as spontaneous coronary artery dissection heart attack, which is accessioned by the bursting of heart arteries. Government pathologist Johansen Odour assisted by two specialists seconded by the family and lawyer Maiyan Sankare oversaw the examination. The autopsy was conducted at the Lee Funeral Home where the late CS is still lying in state. 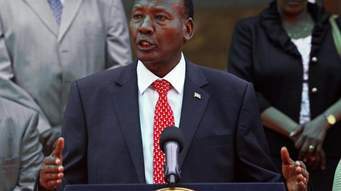 Nkaissery died on Saturday at Karen Hospital. Top detectives among them Nairobi DCI chief Ireri Kamwende, Kilimani DCI boss Philis Kanina and Karen DCI boss Joane Njoki together with detectives from homicide unit were also present at the mortuary. The examination started at around 10.30am and was scheduled to end at 4pm. Dozens of family members, state officials from interior ministry frequented the venue as the postmortem was underway. Doctor Bessie Byaikika said the CS had suffered ruptured arteries of the heart which they attributed to high blood pressure. The doctors ruled out the possibility of foul play in the CS’s death and said further tests are being conducted to establish the cause of the high blood pressure.